In creating her large modern canvasses, Kozyuk prides herself on her unique painting techniques and her ability to create visually interesting and relevant artwork that appeals to Homeowners, Business Owners, and Interior Designers, alike. With her background in interior design, Kozyuk is able to create original art that can either complement or transform spaces, depending upon what her clients desire. So far, Kozyuk has been a huge success, noting that one client has nothing but her artwork on display at home. 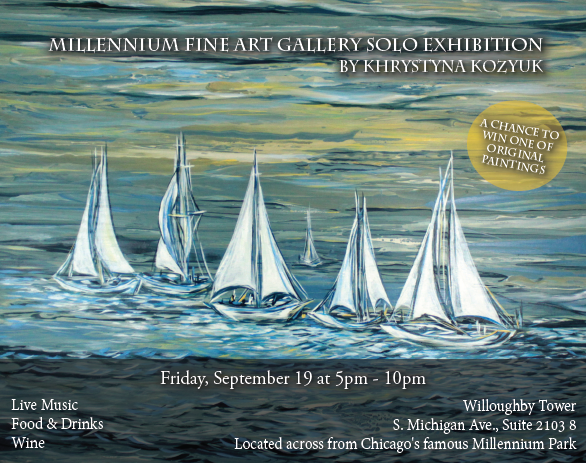 This entry was posted in Openings and Events and tagged Khrystyna Kozyuk, Millennium Fine Art. Bookmark the permalink.